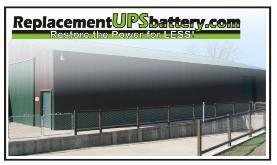 The VB1280 Sealed battery is the ultimate choice for UPS / battery backups, alarm systems, wheelchairs, scooters, etc. Whether you are in charge of the IT infastructure or replacing the batteries in your UPS at home, this is the battery to use. The VB1280 is 12 volt and has an impressive capacity of 8 amp hours, allowing for up to 10% longer runtime than a comparable 7 amp hour battery. The VB1280 has T2 terminals (1/4" across) but T1 are available upon request. Dimesions are 5.94" X 2.56" X 3.7". that you intend to buy. We don't "bait and switch"
This battery has the standard T2 (or F2) terminal.